Woodbridge, United States - March 21, 2019 /MarketersMedia/ — Surviveware has once again proven that when it comes to safety and preparedness, carrying an organized kit is the way to go. The leading hiking and survival gear company have continuously received positive feedback for their line of preparedness gear, particularly their First Aid Kits. Surviveware’s Small First Aid Kit has gained popularity among adventure-seekers and outdoor enthusiasts. It is recommended by hikers and campers going on long or short trips. Moreover, thanks to its water-resistant casing and sealed supplies, the kit has carved its place among hunters and boat owners. The 600D polyester fabric of the kit’s shell makes it convenient and durable. The material is water-resistant and ensures that the kit stays afloat on water. Unlike plastic cases that break when extreme pressure is applied, Surviveware’s polyester kit is malleable and can withstand heavy weight and usage. Surviveware’s Small First Aid Kit contains 100 provisions, enough to cover trips of all durations and styles. The package holds bandages, adhesives, steri-strips, cleansing wipes, and a basic tourniquet. There are also sting relief wipes, tweezers, trauma shears, and a removable CPR kit that owners can hook to their belt or keyring. Unlike kits that are entirely loaded with bandages and adhesives, Surviveware made sure that this kit contains a wide assortment of the most widely used first aid items. It is noteworthy that despite holding 100 life-saving provisions, this kit only weighs one pound, making it easy for hikers and campers to carry a full-blown first aid kit without being weighed down. The kit’s weight and shape allows it to be hung on a carabiner and hooked to any bag. The kit also has MOLLE-friendly straps that safely secures the kit on rucksacks, hammocks, lines, tents, hydration packs, or daypacks, allowing easy access to it. Kit owners also love the organized and systematic vibe of the kit. The supplies are held within organized, labeled compartments that keep the provisions separated. Each compartment is marked, which helps keep the supplies in order and identifiable during critical situations. 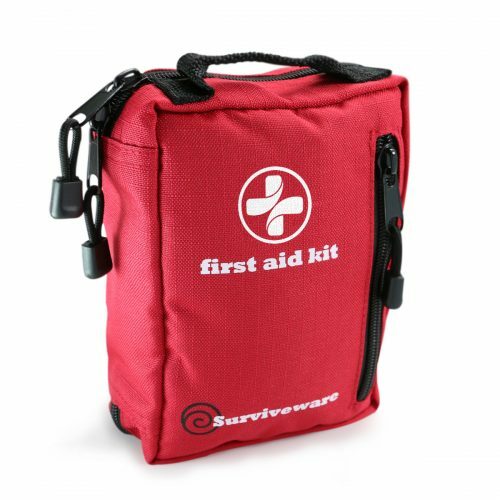 Enjoy the benefits of having a functional and portable first aid kit that impresses even the most meticulous buyers by purchasing Surviveware’s Small First Aid Kit. Order one today and slash 20% off your purchase by using a Surviveware Amazon discount coupon. Grab your Surviveware Small First Aid Kit now by clicking here.